Forgive me, as I don’t usually communicate with computers. Or even pens and paper, for that matter. It just takes so much longer than the types of communication I prefer. Professor Isaac Digby, I found your post and had to respond immediately. 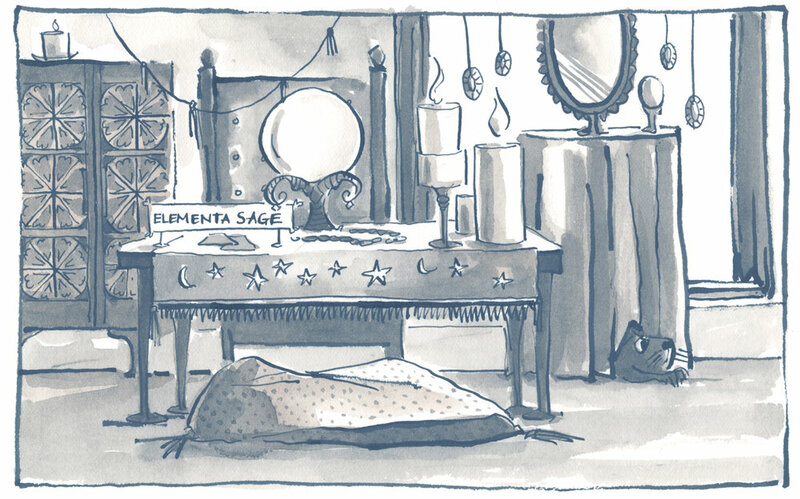 I am Elementa Sage, Communicator, and I have lived a life filled with “unusual events”. I learned to read minds before I learned to read books. And yet, what happened to me on August 21st feels even stranger. While you were in Siberia, most of North America was busy planning for the total solar eclipse. People in San Francisco were buzzing around in search of eclipse glasses and viewing spots, but I was drawn to my crystal ball. There I saw a one-horned animal, surrounded by a hazy bluish glow, with mountains behind and what looked to be an orange tent. This was most atypical. I always ask my ball questions. It has never before presented me with a story of its own. So, I went to the cabinet for my most prized deck of cards—the deck I consult only for the biggest mysteries. As always, I counted out seven cards and laid them in front of me. Then, also as always, I turned them over. But, how to explain what I saw? They were not my cards. No, instead of the usual moon and stars, they depicted horses wearing hats. Or, I suppose they could have been unicorns in disguise? Who knows. All I can say for certain is that those cards had changed since the last time I used the deck. Professor Digby, while it is true that I am acquainted with many types of magic, this sort of magic is entirely new to me.